Rhodri Davies at rehearsals for premiere, handling a milk whisk with a feather attached. Two harpists perform in the piece: Rhodri Davies performs live on stage. 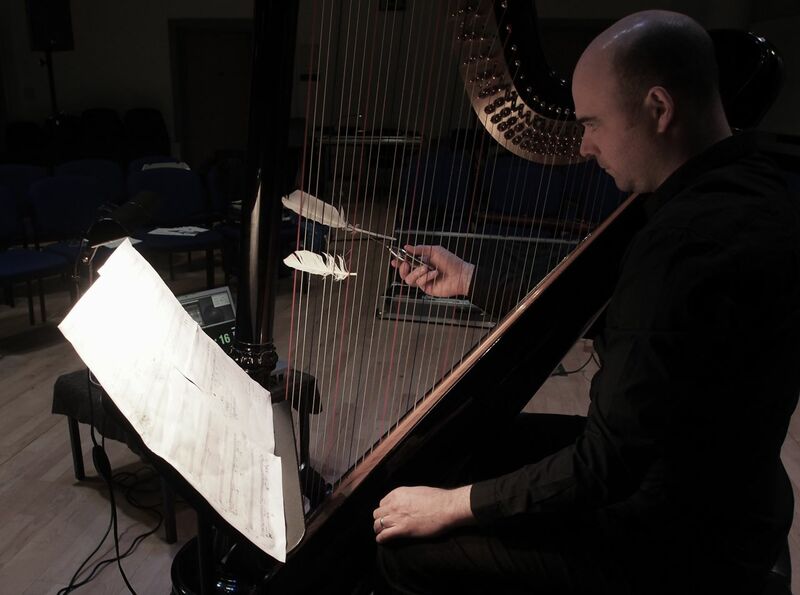 The other harpist, Gabriela Mossyrsch, has been recorded performing in Vienna. 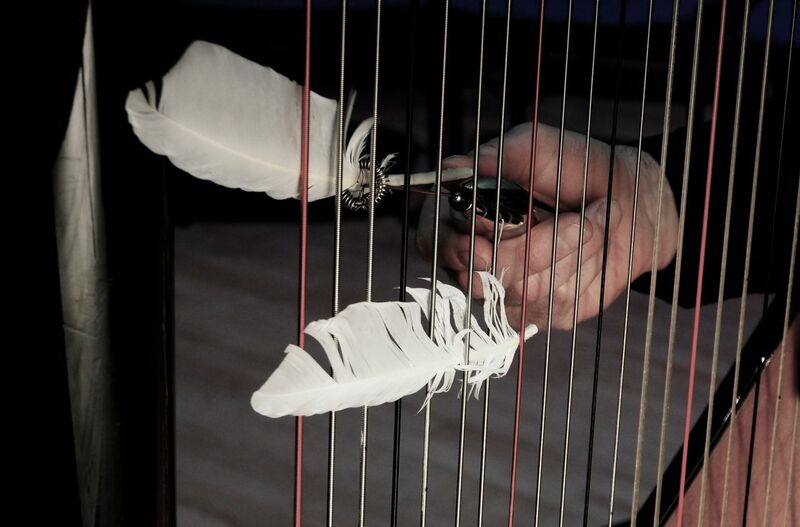 Each of the two harps is tuned in a different microtonal scordatura. While the ‘outside’ part moves from noise to sound, the ‘inner’ part develops into the opposite direction: from pitched sound (more precisely: feedback sounds) to noisy parts. There are two individual scores for the two harpists. I want the two harps to merge into one sonic object. Here I use two vibration speakers placed directly on the soundboard of the harp on stage. The electronic track is thus filtered by the resonance of the harp. Resonance and live performance radiate together, and even interfere acoustically with each other in this setting. I composed the soundtrack with recordings of the first harp, vocal recordings and further electronic sounds/noises. The text reflects the notion of ‘forced resonance’ and poses the question: Can a string resonate out of free will? Does sound need resonance? Is resonance always forced? In both noisy parts, the inside playback and the outside performance, goose feathers are used to excite sounds from the harp’s strings. They play with the image conveyed by the song, the goose wanting to be free. Also, feathers have been used for hundreds of years to write and compose, or to pluck the strings of a cembalo. Here you can listen to the electronic track. On stage the sound appears different, more like coming from inside a closed box, because of the resonance of the harp – a trapped voice. The concept of a ‘remote’ feminine presence underlines the social implications of my compositional plan. Patterns of gender interactions pervade musical performance and the history of instruments, as well as music as such. In this piece, I work and play with this background noise from a feminist composer’s point of view. The text was written during the composing process. Writing a text parallel to a composition is something I often do, it has become a practice for me. The texts I write parallel to the composing process are side chain of creativity, a source of further insights, and quite often they become part of the composition. They add the level of verbal communication, a composer’s commentary. The recent performance of the piece by Mona Smale, harp and David Pirró, sound design brought some improvement to the setting, thanks to the engagement of the performers. 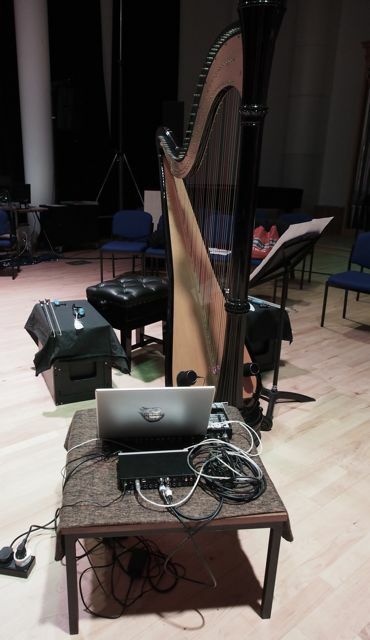 David Pirró added two small speakers on stage, and the harp was slightly turned for better visibility. In the middle part of the piece the amplified harp-sounds (including the transduced track, as it sounded from the harp) were projected from the two front speakers. This resulted in a well balanced, more fully audible sonic result, plus the text could be better understood. Also, it helps not to have the computer on stage:-) Thanks to both performers! The video was recorded with my mobile phone during the performance, and shows the beginning of their version.